Finding that perfect gift for a loved one is tough! Why not provide them with a lifelong memory. Pre-purchase one or our many Summer or Winter Adventures….or bring your loved ones closer to you with a pre-paid shuttle gift certificate. The possibilities are endless, just add one of Jasper’s Coolest Experiences! 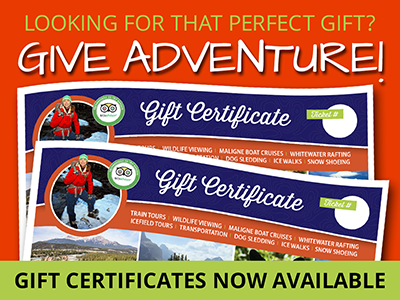 Gift cards can be purchased for a specific tour such as an Icewalk, Wildlife Discovery Tour, Jasper Train Journey or a designated amount. It’s the perfect Christmas Gift! Contact us today to inquire about that special gift!